Milk and cereal bars are the perfect complete breakfast on the go. This version is much healthier than the packaged kind—with no added sugars, oils, or preservatives. Instead of additives, this recipe uses real milk ingredients. Greek yogurt and boxed cereal are all it takes to make these delicious breakfast treats. You can use any kind of cereal you like. 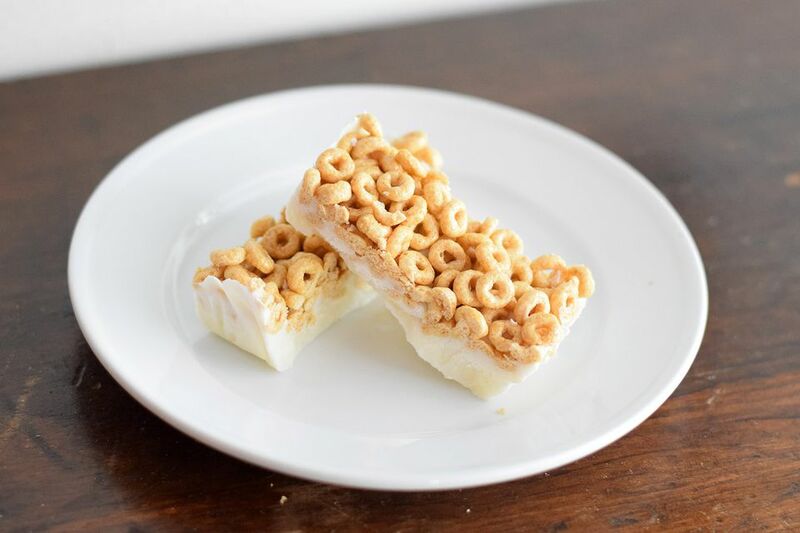 This recipe calls for Honey Nut Cheerios or other similar cereal, but you could try anything from Cinnamon Toast Crunch to Lucky Charms to Honey Bunches of Oats. You could also add things like dried fruits and nuts to boost nutrition and create a lovely texture. The recipe calls for Greek yogurt but you can also use regular yogurt. The Greek yogurt freezes well and stays solid for a long time. It is also higher in protein than regular yogurt since it is strained. Most vanilla flavored yogurts are sweetened but some are sweeter than others. Add honey if you would like to make the yogurt a bit sweeter. This recipe uses the freezer to create the bar shape. They are perishable but take a while to melt and can easily be eaten on your morning commute. They last up to 6 months in the freezer. You can make large batches and have them handy for weeks! No cook recipes are especially helpful in the summer months because there is no need to heat up the house with a stove or oven when you can simply whip these bars up and store them in the freezer. They are also individually wrapped after they have been frozen. It's as easy as unwrapping an ice cream sandwich! Who doesn't love pretending to eat ice cream for breakfast? If you are adding the optional ingredients, mix them with the yogurt before starting the next steps. Some yogurts are sweeter than others and will not need the additional sweetener from the honey. Line a loaf pan with a sheet of parchment paper. The paper should cover the bottom and the sides. This step is essential. Without the parchment paper, the bars will be extremely hard to remove from the pan. Spread the yogurt onto the bottom of the loaf pan. Make sure it completely covers the bottom and is spread evenly. Pour the cereal onto the yogurt. Use a spoon to press the cereal into the yogurt so it will freeze together. Cover loosely with plastic wrap and place in the freezer for 4 to 8 hours or until frozen solid. Remove the bars from the loaf pan by lifting up the sides of the parchment paper. Remove the bar from the parchment paper and place on a cutting board. Cut the bars widthwise into 6 bars. Wrap each bar individually with a sheet of wax paper. Place the wrapped bars in one large ziplock bag and return to the freezer.